Thanks to Peter Berley for this amazing recipe! I had the pleasure of attending Peter Berley’s “Go With the Grain” class at the Brooklyn Kitchen earlier this week. He is the author of The Modern Vegetarian Kitchen, and The Flexitarian Table. I learned how to create a variety of grain salads from a real expert. My friend JL and I teamed up to create the tiny vegetable salad. This was my favorite, and not only because of my love of all things miniature. We sharpened up on our knife skills, and then diced our way through the class to create this beautiful and healthy salad. I re-created it this morning to bring to a vegan-hosted July 4th BBQ. 1. “Water is the flavor killer in salads, ” according to Berley. In order to avoid this, I patiently drained and dried all vegetables in colanders and between clean kitchen towels. I preemptively murdered the heck out of the water. The results are very flavorful! 2. When making grain salads, the ratio of acid to oil should be equal, or even add more acid. The grains soak up a lot of the flavor. This is way different from making a green salad, where the ratio is typically much more oil to acid. Cook barley: I put 1 cup of barley into 2 1/2 cups of boiling water, and then let simmer for 35-40 minutes. Then, rinse and drain completely. His recipe says to add 1/2 teaspoon of salt to the water when you add the barley. I omitted this salt. Add the squash, zucchini, and onion to a steamer, and steam for 3-4 minutes. Shock the vegetables in a large bowl to stop the cooking. Drain thoroughly. I let sit between clean kitchen towels to get as much water out as possible. In a large bowl, combine the steamed vegeables, barley, cucumber, bell pepper, scallion, and dill/parsley. In a separate bowl, whisk together the olive oil, vinegar, lemon juice, 1 teaspoon of salt, and black pepper to taste. Pour the dressing over the salad and mix well. Garnish with watercress. What a great homage to our class! And thanks for the shout out. 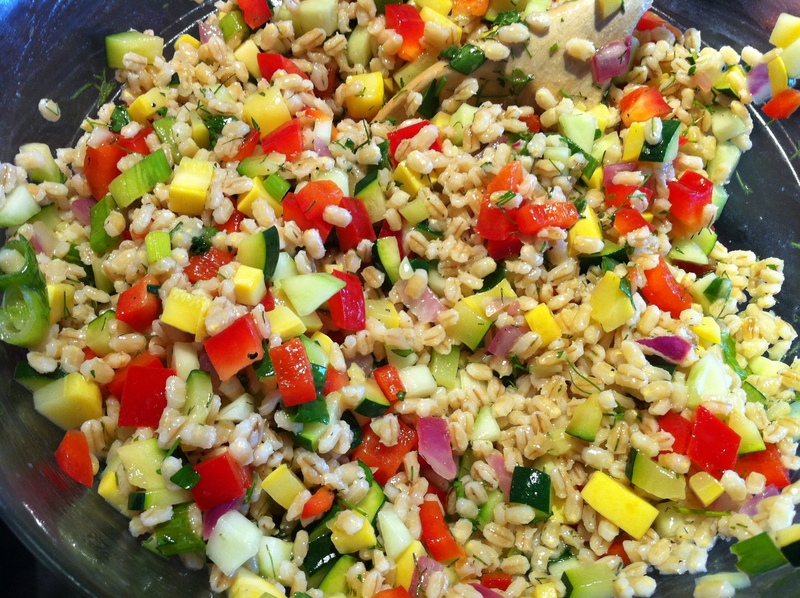 I bought Berley’s barley at the coop today to recreate this salad, too. Umeboshi. Yum. Jess–How did yours come out? I think I went a little overboard with the dill the second time around. Think I’ll try to make the chickpea one next.